Whether you’re like me, a 20-something student with not a lot of extra spending money, or you’ve recently moved into your first apartment and don’t have a lot of your own furniture , or you’re just trying to save a few pennies for your next splurge on a pair of gorgeous designer shoes, it’s likely you’ve got a few pieces of hand-me-down furniture in your home. You might have been lucky, and the hand-me-down is in perfect condition, or perhaps even passed down so many times that it is now a veritable antique. But others of us are perhaps not so lucky, and the piece of furniture bears the scars it had accumulated over its long life with another owner. You walk by it in your house, wince and mentally tell yourself that once you have enough money, you’re going to go out and buy a replacement for that eye-sore; but until that time comes, you’re resigned to holding on to it, because, hey, where else are you going to eat your dinner if not for your great-aunt’s old, beat-up dining table? Hopefully, today’s post will give you a little bit of inspiration for turning those second-hand, Salvation Army specials into focal point in your home. 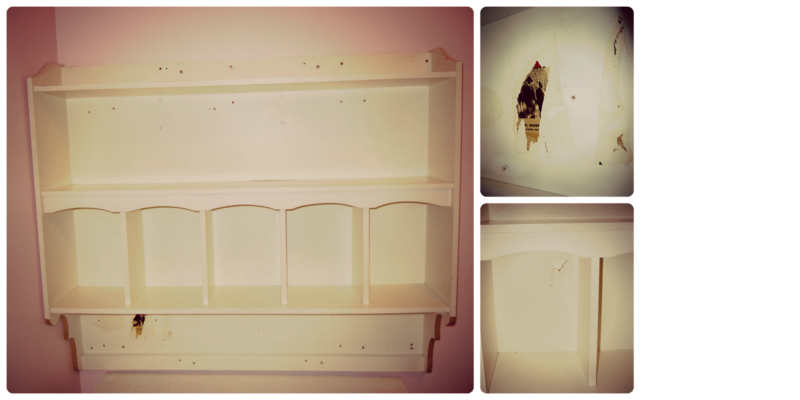 This post focuses particularly on re-vamping (or “upcycling”, as my best friend calls it) an old above-desk shelf in the hopes of creating a tranquil and eye-pleasing study space, but if you use your imagination a little, I think you could apply this type of “revamping” to a whole range of hand-me-down furniture. 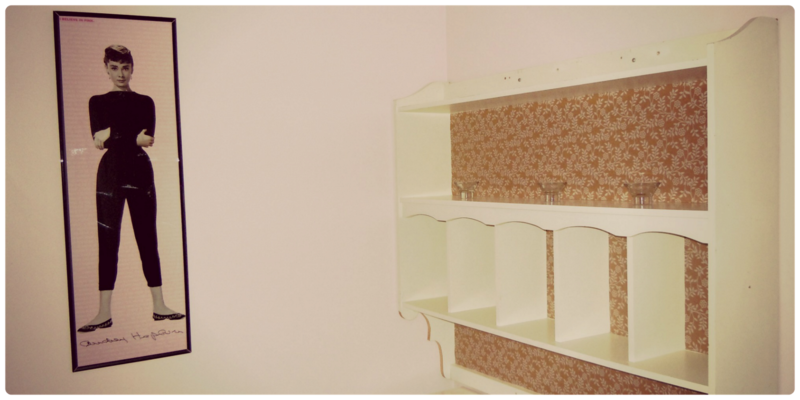 Above my desk, I have this old, white particle-board shelving unit that has been through almost every person in my family before coming to its current resting place. Supposedly it was originally the headboard for a twin-sized “Captain’s Bed“, which is a type of bed that has storage or shelving space built in to it. It’s belonged to both my dad and brother as an above-desk shelf, and was most recently used by my sister as its original purpose: a headboard. While it has managed to stay in one piece, it does bear a couple of scars: screw and nail holes in various places, scratches, a large crack in one cupboard hole, and the remnants of stickers advertising summer concert tours for Snoop Dog and Jay-Z, circa early 2000s (ie. when the shelf belonged to my brother). I wanted to update the shelf without painting it, since particle-board furniture generally doesn’t take very well to paint. In the shops, I’ve seen quite a few shelving units like this which are lined in printed paper, which gives it kind of a vintage, antique look. I thought I would try this out on my shelf, DIY-style- if you feel like trying it out on yours, follow along below! For my shelf, I was lucky enough to find at the dollar store a roll of gorgeous, recycled-style wrapping paper printed with a white floral pattern: paid $1.25! How’s that for penny pinching? 1. Firstly, measure the portions of your shelf you’re going to be covering in wrapping paper. For my shelf, I decided just to do the “back” of the shelf, and not the surface you put items on. This meant measuring the dimensions of the two longer shelves, and then measuring the dimensions of one of the smaller “cupboard” holes so that I could make 5 copies. Once you have your dimensions written down (ie. 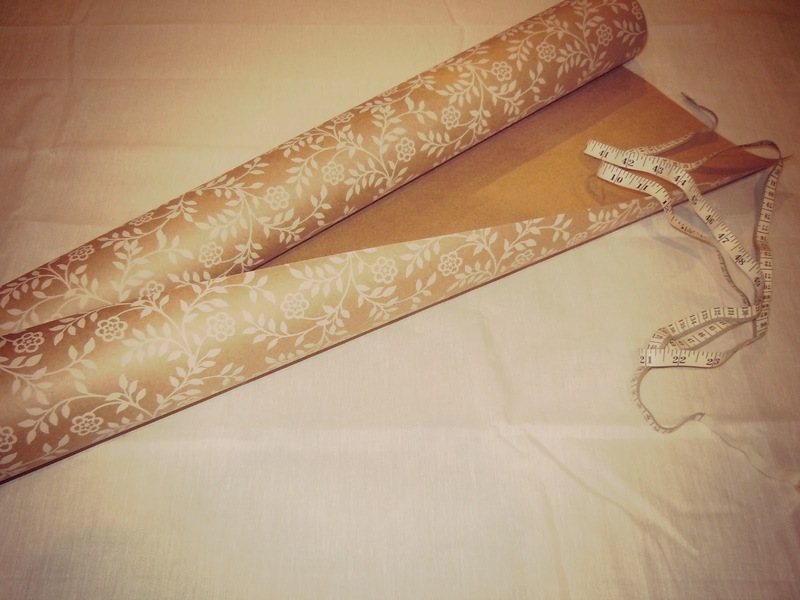 5 copies: 30cmx 25cm ), measure and mark out pieces of the wrapping paper in the dimensions needed, using a large ruler or yard stick to help you keep the lines as straight as possible. 2. Time to cut! Now that you’ve drawn out the sizes of paper needed to line your shelf, it’s time to cut the pieces, being as careful as possible to keep the lines straight. One good way to do this would be to *carefully* use an exacto-knife and a yardstick to cut the paper in a perfectly straight line. Unfortunately, I was doing this on my wood dining room table, without a cutting mat underneath it, so I used a large pair of shears and cut extremely slowly to make sure I was cutting as straight as possible. 3. Until you have time to put the newly-cut pieces up, lay them out carefully somewhere they can’t get mangled, or perhaps even roll them up, since having a shelf lined in crinkly, dog-gnawed paper (as would probably happen in my house) is not exactly an “upgrade” to your hand-me-down furniture. Also, now would be a good time to hold each piece of paper up against the part of the shelf it will be adhered to, just to make any last-minute cutting or trimming changes, just in case it doesn’t fit. 4. Prepare the surfaces of the shelf that are going to be covered by getting rid of any bumps, cracks or uneven spots that could show through the wrapping paper. There were a couple raised bumps on my shelf that were the result of someone trying to put a screw in, and then changing their mind; I sanded these down with a piece of sandpaper until they were reasonably flat. In one spot where there was a large crack, with the broken edges of particle board sticking up, I put a piece of duct-tape over top to smooth it down. Remember, it doesn’t have to look pretty: no one is going to see it once you put the paper over top! 5. Pick your adhesive. Double-sided tape could work well, although I had double-sided scrapbooking adhesive on hand, so I used that. It just has to do the job of getting the paper to stick to the shelf in a overall seamless way. Just a warning: I covered my shelf in paper with full knowledge that there was a good chance the adhesive might not come off again – the adhesive I chose wasn’t made to be removable. If you are worried about this, try visiting a crafting store to find a non-permanent adhesive. 6. Cover the pre-cut pieces of wrapping paper in your chosen adhesive, trying to get the adhesive as close to the edges and corners as possible so that any chance of the paper peeling off your shelf is minimized. Put adhesive in many different spots on the paper, so that the paper will stick to the shelf evenly, without bulges from areas that didn’t get enough adhesive. 7. And here’s the moment of truth: it’s time to put your pre-adhesived paper on your shelf! Being very careful, choose one corner of the paper and line the corner of the paper up to the matching corner of the shelf. When you’re pretty sure it’s lined up well, press the paper down to adhere it to the shelf (remember, we already put adhesive on it!) Pulling at the paper to ensure it is straight and “stretched out” as it should be, work your way along the paper, pressing down to adhere it, until you get to another corner. Now you should have the paper attached along one full edge. Holding both of the unattached corners of the paper, pull the paper tightly so it is fully “stretched out” and press down both unattached corners into place. You might have to pull it back off again a few times until you get the placement right (I know I did!). Once you’re happy with the placement of the paper, use your hand (or a dry cloth, if you’re worried about skin oils) to smooth down the paper, making sure the adhesive is sticking everywhere. You’ve now got your first piece down- congratulations! 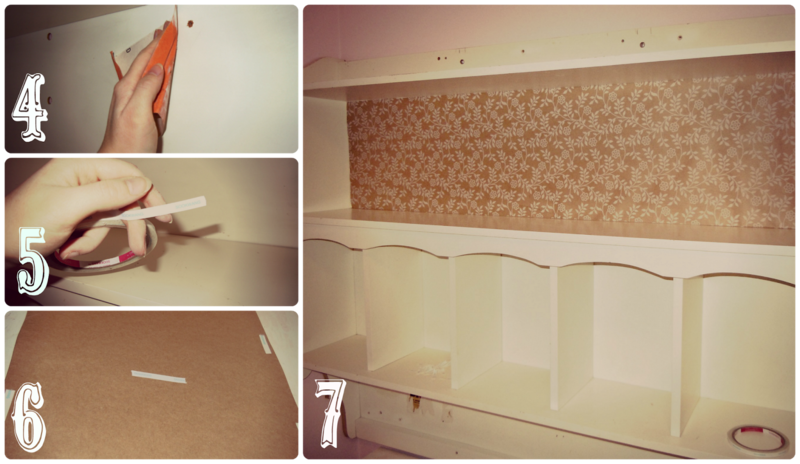 Now you just have to repeat step 7 again until all your pieces of wrapping paper are put up, and then voila! 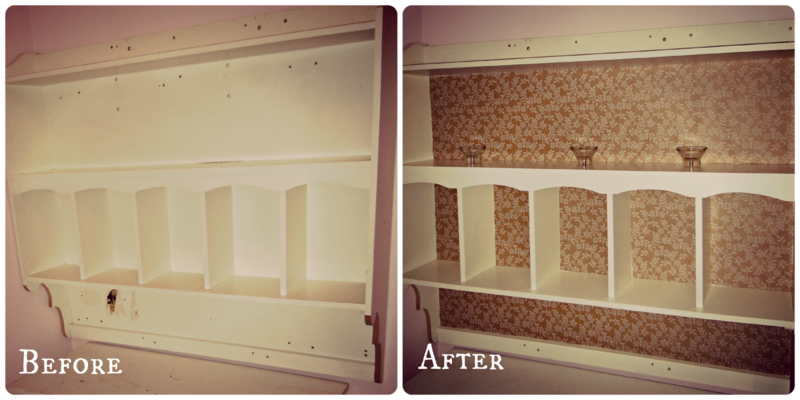 You’ve just instantly “upgraded” your hand-me-down, turning a former eye-sore into a customized piece of functional art! I hope you guys were inspired to think twice about chucking that hand-me-down in the dumpster and instead have a little fun with this DIY project! I’m really happy with my shelf turned out: definitely makes my little study area a little more beautiful and tranquil (which, really, is a lot to ask for from a study area where you usually feel like pulling out your hair in frusteration due to homework!) So, hopefully you are able to get as much out of this project as I was! If you have any comments, I’d love to hear from you, so post away! What is the double-sided scrapbooking adhesive? Is it like a tape? This is an awesome idea! 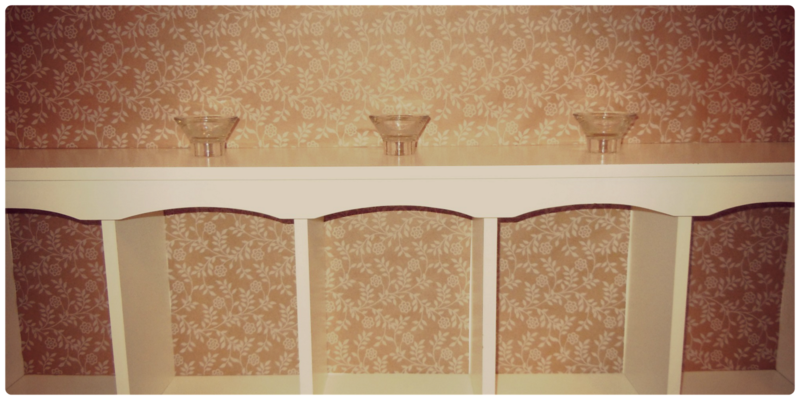 My husband and I actually like buying things from the thrift store and sprucing it up a bit. He also wants to start building us stuff like our own coffee table. This was such a cute idea! Do you have anything on turning paper, scrapbooking paper, posterboard, maps, etc into wall paper? I thought maybe you could use a modge podge on your wall with whatever paper you want to use and it would stick and also protect it, but I haven’t done any actual research on it yet. This is such a cute idea and it really got me thinking I need to finish my one project that is out in the shed. Thanks so much, so happy the post got you a little inspired to finish your project! Double sided scrapbooking adhesive is super similar to double sided tape (you could probably substitute double sided tape if you can’t find the adhesive!) The only different is that the adhesive is just the sticky stuff in the style of tape, but there is no plastic/tape part in it (basically, it’s like glue in a roll, usually you peel off a piece of paper from one side). I use it for everything, even sewing in a pinch lol. I love your idea about the wallpaper! I’ve actually never used mod podge (what a bad diy blogger I am!) So I’m not sure about that one… but my brother once wallpapered his room with printed paper using wallpaper glue… although I would give it a try in a small area first if the type of paper you are using is not typically used for wallpaper since some colours/images could run when you put the glue on! I’d love to see how your project turns out though if you go ahead with it! Ah. I can see how the scrapbooking adhesive works now. Ahah. I think I would just buy the wallpaper glue. I don’t think you could go wrong with that.